The Customer once attracted towards your services, becomes one of the most valuable assets to your organisation. The challenge faced by your organisation is to Maintain, Retain and Attain. Mainstay�s unique Lifecycle Management Services help you leverage your business strengths in providing valuable services to enhance customer visibility with customer growth. The acquisition solution is built with years of experience in converting every call into a possible customer. Mainstay's unique Customer care and Retention solutions is worked on using data gathered from Relations and Feedback, making the customer service and support a truly magnificent experience. Acquisition: An Inbound Sales solution coupled with Email and Chat to acquire new customers. Provisioning: A unique service designed to eliminate paper work and help customers and your organisation field staff to quickly service customers needs during the sign-up phase. Support: One of the most important aspects in handling the customer and helping them resolve any problems with the fastest possible solution. 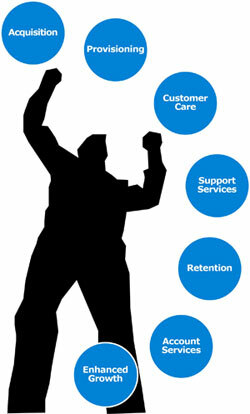 Retention: Mainstays solution driven by customer intelligence helps retains your customer by analyzing customer habits. Billing Services: Our account services enable you relax and ensure you receive your payments on time every time. Enhanced Growth: Using our RFM (Recency, Frequency and Monetary) model helps us identify customer needs and identify.